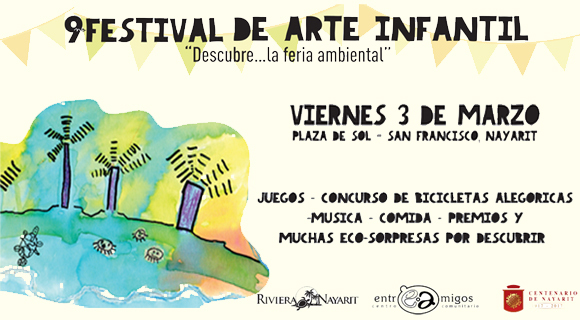 The Plaza del Sol will host an artistic and cultural event with a focus on the environment, where the children can enjoy workshops, games, story telling, music and much more. “The theme of this year … is because of our commitment and search for creating and augmenting awareness about the importance of taking care of our environment, and how our actions and attitudes can change our daily lives, to promote a healthier, more loving life between ourselves and the world we live in,” reads the Entre Amigos press release. The inaugural parade begins to wind its way to the Plaza del Sol at 3 p.m. on the dot, the usual site of artistic and cultural events for this micro-destination, where they will celebrate this traditional family event at 4 p.m. Kids can attend the event for free. It will include recreational and environmental games, productive workshops, story time and much more. At the end of the Eco Fair, the children will show off the results of their various fun activities they made during the course of the event. The allegorical bicycle race is one of the most awaited activities of this environmental festival, which will also offer music and traditional treats. Entre Amigos is recognized as an Educational Center with Environmental Consciousness (CECA by its acronym in Spanish) by the Ministry of Environment and Natural Resources (Semarnat by its acronym in Spanish), thanks to its commitment to fostering awareness on environmental topics through culture and the arts. For more details visit: http://entreamigos.org.mx/.